Cooking with pomegranate can be a little bit of a challenge to those who don't like to get messy in the kitchen. Personally, that's never been an issue of mine. The messier things are, the better the result! These red jewels can really be a tad messy to free, but once out they are sweet, crunchy and absolutely delicious. And don't they add something special to anything they touch? This is a really, really simple dessert to put together but looks great when it comes out to the table. I like these kind of desserts that you can whip up really fast, and serve for a casual family dinner as well as a fancier affair. Melt the chocolate in a double boiler. Once melted, leave to cool down in a bowl. Take a cold stainless steal bowl and pour in the cold whipping cream (placed for 30 minutes in the fridge). Using a hand mixer, whip the cream for 2-3 minutes. Add the granulated sugar and whip until the cream has the consistency of light whipped cream. Place in the fridge. Beat the egg whites (with a pinch of salt) to firm peaks. Gently fold the egg whites with the cream and add the cooled white chocolate. Take your glass serving bowls to start building the dessert. Add a dozen pomegranate seeds at the bottom of each bowl, top with few ginger snaps pieces and top with a generous ladle of the whipped cream mixture. Add another layer of pomegranate seeds and ginger snaps to decorate. Tip: If preparing in advance, leave the whipped cream mixture in separate bowl. Do not put the ginger snaps in the fridge or they will become soggy. Build the desserts just before serving. Enjoy! What a lovely dessert idea! Be still my heart. I don't know if I'm more jealous of your recipe or photography. This looks and sounds wonderful. I've used lime successfully with white chocolate. I'll wager this is even better. This has me dreaming of fall so much! Amazing!! I always love your flavor combo's. Perfect as always. Oh I can't wait until I start seeing pomegranates! Probably my absolute favorite fruit and always worth the effort and mess! This looks incredible - with white chocolate omnomnom! Your photo is gorgeous! 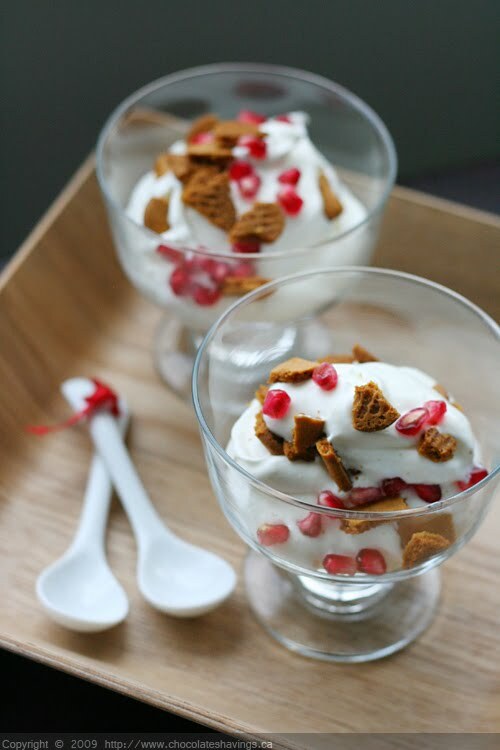 Each bite must taste amazing when the pomegranate seeds burst pizzazz into the sweet, mellow white chocolate mousse. I was just daydreaming about white chocolate mousse today... your photo is stunning and the recipe sounds delicious! So gorgeous, honey! I'm bookmarking this one for the Holidays - it will be so pretty at Christmas! I don't care about all the prejudice involving white chocolate - I love it! These flavors sound great together, and the colors... Beautiful! Beautiful! And what a fabulous flavor combo. Pomegranate and any chocolate flavor is actually a fantastic combination! This mousse looks really great! Excuse me while I wipe up the drool on my keyboard. This looks perfect. The colors of this compliment each other so well...it looks smooth and great. This looks absolutely amazing! I was so happy when I saw pomegranates the other day in the store. Can't wait to try this. Girl! You never cease to amaze me! These are perfect. Don't change a thing. I am going to make these for a treat for my hubby. He is a nut about white chocolate. Thanks, once again, for the good times. What an interesting flavor combo. I love the addition of the pomegrante and gingersnaps. Lovely flavours! I love pomegranate but it's a pain to deal with, I like to buy those that are ready to eat =) lazy me. Yum! I agree that I don't mind the mess from poms because they're so delicious but I find one way to help minimize this is to crack it open and then pull it apart in a bowl of water. The seeds will go to the bottom and the white part comes to the top. It is such a pretty and elegant dessert! Looks so yummy especially with the gingersnap cookies. Great pictures. Indeed pomegranates are messy! But so fun to play with. Your recipe looks delicious! A very pretty, elegant and rich dessert. Great photo, too. What an absolutely gorgeous combination of flavours! Beautiful. What a great idea! These are some of my favorite ingredients! Oo that looks so gorgeous and delicious! And an excellent idea for dessert indeed! Your photos are so beautiful. I can't wait to get my hands on some pomegranates, and I love the pairing of white chocolate. Each of the dessert here is heavenly. Superb collection of dessert recipes. I love when Pomegranate is in season. There are so many delicious snacks and desserts I can make finally! This looks absolutely delicious. Going to have to try it before pomegranates go back out of season.